JC Penney gets put in purgatory at Google for link farming. AT&T, Siemens and others are buying SEO links on Forbes and get busted. Employees of these brands may or may not have known exactly what was going on. But I’m guessing more than a few execs were unpleasantly surprised by the news. Wondering who exactly is doing what to your brand out there in SEOland, and how bad of a hit you might take? Then you may want to use a tool that will show you the warning signs of link farming. 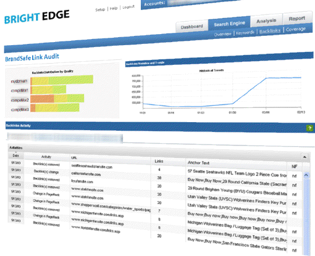 SEO firm BrightEdge is giving people a free tool to do this. The timing of it couldn’t be better. The new tool, called BrandSafe Link Audit, is “a new, free analysis and alert product that can expose disreputable SEO techniques to CMOs before they end up in the headlines.” It tells you about the quality of backlinks to your sites and whether or not you may be at risk from paid links and link farms. It’s also, of course, a lead generation tool for BrandSafe’s other SEO products. But at this point brand managers may not care, they just want to know exactly what their SEO consultants are up to. If you want to use the product, sign up here.